Damian's presentation, Geek Eye for the Suit Guy, will look at what Open Source software is and isn't, examine its advantages and deficiencies compared to proprietary software, lay out the basic business case for considering Open Source, and enumerate the major questions that need to be answered when making any strategic software decision. But more importantly, we'll look at those issues through geek eyes. Open Source software development and support is based on a model of collaborative interaction that is entirely different from the competitive world of commercial software. It's not a business; it's a culture. 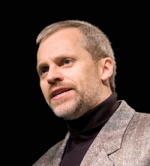 About Damian Conway: Damian was the winner of the 1998, 1999, and 2000 Larry Wall Awards for Practical Utility. The best technical paper at the annual Perl Conference was subsequently named in his honour. He is a member of the technical committee for The Perl Conference, a keynote speaker at many Open Source conferences, a former columnist for "The Perl Journal", and author of the books "Object Oriented Perl" and "Perl Best Practices". Eight speakers, five minutes each, bringing concise overviews of open source geospatial software, community building, open geodata projects, and amazing whizzy demonstrations! Chris Schmidt, Boy Genius, Metacarta Inc. The 2008 conference organizers will give the scoop on the next FOSS4G event! South Africa is proud to have been chosen to host FOSS4G 2008. Join us in Cape Town from September 29 to October 3, 2008 to experience the best of open source GIS, our special South African hospitality and an unparalleled diversity of cultures, activities and natural environments. New Features! Slots for public attendance and interaction, outreach to schools, universities and communities and technical visits. Local non-FOSS people will be joining us. Government and the education sector will be well represented. Building on the 2007 event, 2008 will have lots more to offer, and a unique regional perspective on open source geospatial. Peter has been CTO of Intergraph, Founder and CTO of Ten Sails, now Ubisense, and VP of Technology at Smallworld, now part of GE, and he is currently blogging and deciding what to do next. Tim is an independent geospatial consultant who has become a battle hardened deployer of Open Source in Australia. He is still looking for his ideal project on the French Riviera or the Bahamas. Since 1980, Mark has been charged with the development and management of large geospatial environments. In the early 1990s he led the development of the Spatial Archive and Interchange Format, a precursor to GML, and since 2000 he has been a major proponent of geospatial open source software in British Columbia and Canada, as well as a proponent of Canada's GeoConnections and GeoBase programs. Frank Warmerdam is an independent geospatial open source software developer, and has been working on the GDAL/OGR library for seven years. Previous to that he was a senior developer at PCI Geomatics for six years. Frank is an occasional contributor to many other open source projects (prominently Mapserver and PROJ4), winner of the first annual Sol Katz Award, and is currently President of OSGeo. The Sol Katz Award for Geospatial Free and Open Source Software (GFOSS) is awarded annually by OSGeo to individuals who have demonstrated leadership in the GFOSS community. Recipients of the award have contributed significantly through their activities to advance open source ideals in the geospatial realm. The award acknowledges both the work of community members, and pays tribute to one of its founders, for years to come. Update: The 2007 recipient was Steve Lime, the original author of Mapserver. Adena Schutzberg, Executive Editor, Directions Magazine shares her observations on the conference, and open source in general, and how she thinks open source is interacting with the "traditional" geospatial software community. In a display of journalistic virtuousity, she will re-cap the conference before it is even complete.